This is the moment 71-year-old Tower Hamlets Alzheimer’s ambassador John Wright was asked to stop filming a segment of last Wednesday’s full council meeting. It demonstrates the confusion caused by Eric Pickles’ announcement a couple of weeks ago that residents had the right to film their councillors in action. Just hours before the meeting was due to start, Tower Hamlets council’s most senior officer, Stephen Halsey, wrote to councillors telling them the Communities Secretary’s opinion appeared to be wrong. In a letter, which I reported here, he said the council’s constitution specifically barred filming of full council meetings. This advice was then repeated to everyone in the council chamber by Speaker Lesley Pavitt at the start of the meeting. However, John, one of the borough’s most colourful campaigners, was convinced Eric was right. So, during a segment in which Lutfur’s cabinet member for housing, Rabina Khan, rose to her feet to give her opinion on social landlords, John, who is a longstanding council tenant, got out his camera and pressed start. Just prior to that, I’d tweeted that town hall security guards seemed to be getting twitchy. And so they were. They clocked John and surrounded him. A council civil enforcement officer, one of the £40,000 a year THEOS, flashed his “warrant card” and told him he would call the police. I later saw an officer hovering outside with the chap who runs the council’s CCTV control room. The video lasts for 15 minutes and it’s well worth watching it all. This is a man who clearly thought a senior Cabinet minister had given him the green light. Following a couple of minutes discussion with the Speaker, who later told him she would try to get the constitution changed, the meeting was suspended until he decided to back down. For about 10 minutes, a series of people talk to him, including the veteran East London Advertiser journalist Mike Brooke, who wrote this report. Commendably, Lutfur’s finance chief, Alibor Choudhury, someone more used to provoking a verbal fight in the chamber, intervenes to calm things down. My Government is filmed, the London Assembly is filmed: why is your council not allowing me to film, or are you hiding something? Why are you not allowing me to photograph when Eric Pickles says I can? This is England–we are democratic. Why are you hiding? Are you all corrupt? In response, Speaker Pavitt tells him they are not hiding anything, just that they need to have procedures in place because there might be some people who do not wish to be filmed. I think she means people in the public gallery. John, who has published the video on YouTube, is for many a local hero and I think his actions will be seen as a tipping point. The council will be urgently looking at ways of allowing filming next time round. The latest edition of East End Life is most interesting for what’s not in it. While on p6 there’s a report on the latest round of cash handouts to various community groups (more of that in another post), there’s nothing about another tax-funded vote buying exercise which was announced on the same day last week. I’ve no idea why Mayor Lutfur or his legion of highly paid “communications” advisers don’t make more of the edicts known as “mayoral executive decisions”; maybe he wants to keep them quiet. But last Thursday, two months later than planned, he slipped out via this section on the council website his latest re-election campaign move. I first wrote about his “Community Faith Building Scheme” here last November when Lutfur’s cabinet agreed a budget for a £2million programme. His cabinet then added a further £1million to this pot in February. 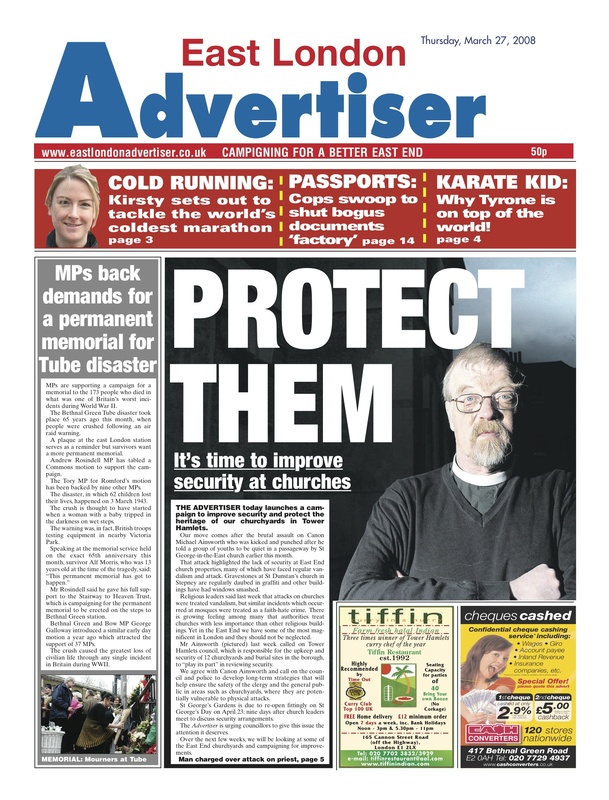 The programme is being funded from supposedly precious council reserves (this in a period of cuts, remember) to “offer assistance to faith communities to repair, adapt and improve buildings in Tower Hamlets in which faith-based activities occur”. The money is being doled out in three tranches and three types of grant were available. Type A had an initial cap of £75k per application for actual repair and revamp work; Type B was for more substantial works with a cap of £300k; and Type C had a cap of £10k to help with professional fees such as architectural advice needed for Types A and B. According to the council’s website earlier this year, 42 bids totalling £2,995,880 had been made. So Lutfur and the officer in charge of the project, the regeneration director Aman Dalvi (who some senior councillors have said is too close to the Mayor), decided to reduce the cap on Type A bids to £25,000 so more groups would get something. So all 42 applications have been at least partially successful and a total of £595,000 of our money has been handed out. Here’s a table that summarises the breakdown by faith. It also shows the 2011 Census results for people who identified themselves by faith. The council said it would use this as a key driver of how it awarded the grants. The Equality Impact statement in Appendix 5 of this document says: “The figures show that the two faiths with the most people according to the 2011 Census (Muslim and Christian) have submitted the most applications, requested the most funding and have been recommended the most funding. Well, the East London Mosque, which is sitting on a cash pile a mile high (its latest accounts show it had £2.7million in its account last year), has been awarded £10,000 to install a new sliding glass door, repaint the dome and minaret, and to clean and polish the signage. You’d have thought it would have been a little more charitable and let a smaller outfit take the money. A few churches have also been successful: the Rev Alan Green, of the Tower Hamlets Inter Faith Forum, will be chuffed that £25k has been given to refurbish his community centre at St John on Bethnal Green. And the borough’s two main synagogues – the East London Central Synagogue in Nelson Street, which is chaired by Leon Silver of the Inter Faith Forum, and Congregation of Jacob Synagogue in Commercial Road – have got £25k between them. The Gudwara Sikh temple in Harley Grove, Bow, which re-opened last week after being destroyed by an arson attack in 2009, gets £15k for, among other things, solar panels. And there are also a few which have been awarded £10k to cover the professional fees needed to explore further substantial works. These include the tiny Bow Muslim Cultural Centre in Roman Road. I wonder what plans they have. The full list is in the documents below. A grand total of £150,000 has been set aside by the council to “project manage” this programme. Presumably, this will include ensuring the money is spent as intended. As for the rights and wrongs of earmarking public cash for religious buildings and activities…well, the council says it’s allowed to. It’s a direct consequence of the Localism Act. The Mayor says he is responding to a community demand. I said last November that if this money is used to improve community facilities that are open to all, ie inclusive, then it’s not a bad thing. But that’s a big if. Many of these places ‘ain’t exactly inclusive. As will be shown at a later date. Tower Hamlets Labour group has sent me its list of questions for Mayor Lutfur for next week. The meeting will be filmed so people can see for themselves how often he speaks. There are also a batch of proposed motions, the most interesting one of which, for me, is the mayor’s continued pimping of Victoria Park. He has just proposed a commercial tender for 10 major events per year there. This, despite a council vote on reducing the number. Referring to Boris Johnson’s proposed fire station cuts the Mayor said in East End Life recently, and I quote “its essential that we take every chance to support the campaign against these cuts”. Can he then tell the Council why he failed to turn up to the crucial public consultation on fire station closures on the 7th May and why he has consistently missed key London Councils meetings on police and fire station closures? Does the Mayor think it is right that after he urged the Boundary Commission to cut the number of councillors, Tower Hamlets will now have one councillor per 4,417 residents yet Kensington and Chelsea will have only 2,270 per councillor? Why should poorer areas like Tower Hamlets have fewer councillors? Market stalls are fantastic examples of our community’s small businesses and we should be supporting them. Recently I met market traders in Whitechapel who told me you have cut pitch sizes for traders in Whitechapel and across the borough. Why have you done this? At our last ordinary meeting the Council passed a motion asking among other things for the Mayor to investigate the status of the investment made by Tower Hamlets in the Women’s Library building and to recognise the building as a community asset. We have since learnt that London Metropolitan University have appointed architects to redesign the interior of the Women’s Library so that they can use it as lecture space. Can the Mayor update the Council on what action he and his officers have taken since the Council motion in April? Local residents from the Longnor Estate have been raising concerns via their Tenants and Residents Association and through councillors about cars speeding round the corner from Bancroft road, which is a dangerous blindspot and suffers increased congestion from both Queen Mary University and Mile End Hospital. Can the Mayor please advise what traffic calming and road safety measures are under consideration for the Longnor Estate, given the high number of families and pensioners living in the area, in response to these concerns? How much has the Mayor spent on the road works/changes on Bethnal Green Road near the junctions of Chilton Street and St Matthew’s Row? What is the aim of these works? What consultation was had with local residents and stakeholders. What plans does the Mayor have to extend the pilot food waste recycling service in blocks owned by East Thames Housing, Poplar HARCA and THCH to other housing associations and private developments? Residents have received letters telling them that the Mayor and his deputy are taking enforcement action in Cudworth St to remove illegally parked taxis. The situation is back to normal again and therefore could the Mayor outline a long term plan for dealing with problems in this area? The Tory bedroom tax is now doing real harm to many of our residents, and the benefit cap will have a major impact very soon. What real practical steps is the Independent Mayor taking to protect residents from these Tory attacks? How many Tower Hamlets households have been moved out of the borough in the last year, and how many are in bed and breakfast accommodation? The Independent Mayor signed the Time to Change Pledge. What has he done to implement it? How many pubs have closed in the borough in each of the last five years? Can the Independent Mayor tell me what costs were incurred in putting Victoria park to rights as regards ground damage last year after Lovebox and live nation; and what costs were reclaimed from promoters. – Offers its sympathies to the family and friends of Lee Rigby. To try to use a warped view of any religion or faith to justify his murder is wrong, and cannot be tolerated. – Calls for unity against the EDL, BNP and others who seek to stir up hated and division. We are at our strongest when we are united, as we must be in the face of this attack in our neighbouring borough of Greenwich. – Is deeply concerned about attacks on Islamic buildings and threats to the safety of individuals and communities. – Notes the EDL threat to demonstrate in Tower Hamlets on the 26th August 2013 and that the Labour Group immediately wrote to the Mayor and all Group leaders asking them to join with us in opposing the march. – Notes that John Biggs AM, Labour Group and local MPs have written to the Home Secretary and Borough Commander raising their concerns and asking for support for a ban on any march. 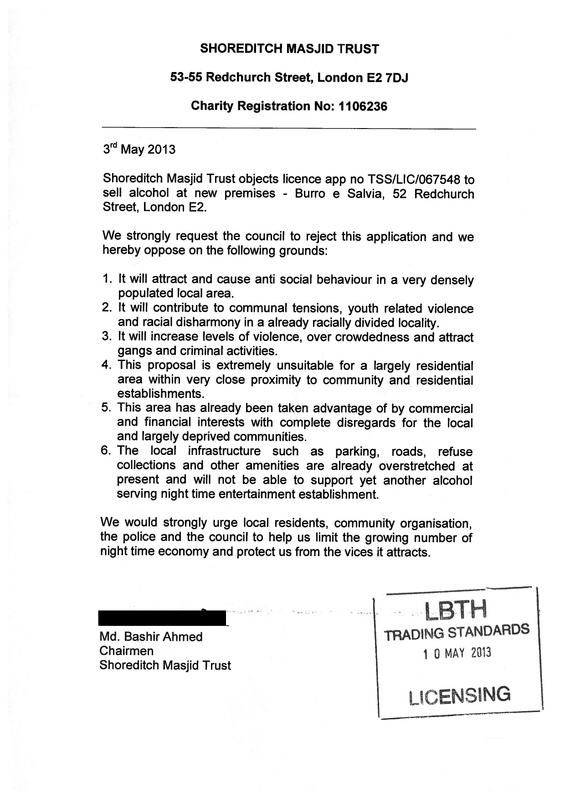 – Supports a ban on the EDL marching through our borough. – To ask Council to write to the Home Secretary in support of Rushanara Ali MP’s request that she take steps to ban the EDL march and ensure that our community is fully protected from the EDL and other extremists. – To work with community organisations, faith groups, local people and the police to maintain calm and safety in our community. – To call on the independent Mayor and all councillors to unite against all forms of extremism and racism. This figure has risen by around 80,000 in the past decade and it set to get worse as the supply of new social housing dries up. The Conservative led government has led a sustained attack on social housing, including cutting funding for building and attacking social security. Only 134 of the 1,618 applicants for four bedroom social housing in the borough were catered for in 2012, with only 16 of those in properties owned by Tower Hamlets Council directly. Save the Children’s 4in10 campaign is calling on the Mayor of London to commit to halve the number of children growing up in overcrowded conditions by 2020. The 4in10 campaign is right to focus political attention on the Mayor of London as his “Action Plan” is an inadequate response and fails to make tackling overcrowding a real political priority. The London Borough of Hackney recently decided against agreeing a programme of multiple events on Hackney Marshes each summer after a majority of residents there opposed those plans. LBTH should use the full force of the law to recover any legal costs incurred in renegotiating a three-year contract entered into by the Mayor and Cabinet Members from those authorising it. The Mayor should in the meantime bring forward a renewed Open Spaces Strategy to the next ordinary Council meeting, including within it the amendments set out above, to ensure a more balanced approach to commercial events while the consultation is being carried out. To publicise the campaign to local Labour Party members and residents to help raise public awareness of this problem and pressure on the Mayor of London to act. To call on the Independent Mayor of Tower Hamlets to keep his promises to local people, and deliver family sized homes. This Council notes the terrible loss of life in the recent factory collapse in Bangladesh. While there may be many underlying reasons for this disaster, and the Government and its agencies in Bangladesh need to continue to investigate and to hold those responsible to account, and while the rapid economic growth in sectors such as the garment industry in Bangladesh is to be welcomed, and is an important providers of wealth and employment, the event also highlights the challenging working conditions of workers in many developing economies. 1. To support and encourage closer relationships between local government bodies in the UK and Bangladesh in order that good practice and experience can be shared. 2. To ensure that it follows ethical procurement policies in its contracts, and to support campaign organisations and trade unions that promote ethical procurement and which can help to promote good employment practice and safe working conditions without stifling economic growth. 3. To encourage others, more widely but in particular in our borough, and including in Tower Hamlets schools, to follow ethical procurement guidelines. 4. To congratulate those bodies and individuals in Tower Hamlets and beyond who have helped to raise funds and support to assist those affected by the disaster. Mayor Lutfur’s office is complaining about Channel 4’s Dispatches again (for the full statement, see the update below). He thinks they haven’t told the full story of his daily use of a chauffeured Mercedes to ferry him from home to mosque, from home to work, from work to home and from function to function. Too right. He should attach a webcam so we can take a peek at any time. So the council, never one to shy away from bullying the media, is now threatening legal action. The quotes from the mayor’s office in the East London Advertiser are hilarious. They seem particularly vexed that people are criticising the Dear Leader for allowing the car to hang around while he has lunch. Bizarrely, they seem to have tried to justify this on cost grounds. They say it’s cheaper (in terms of petrol costs) for the chauffeur to “circle” around the borough than pay for parking. That’s really odd: that chauffeured Mercedes has a special “all zones” parking permit that allows the driver to park anywhere in the borough – except in bus lanes and other banned places. More disingenuous spin. he must think voters are thick. And note, no mention to the ELA of the environmental costs. Legal action is being threatened by Tower Hamlets council over Channel 4 secretly filming Mayor Lutfur Rahman being driven around Whitechapel in London’s East End in his chauffer-driven Mercedes that’s paid for by taxpayers. The Mayor’s Office disputes points made in Monday’s Dispatches documentary on how public money is being spent by local authorities up and down the country. A film-crew followed the mayor’s £35,000-a-year rented limo driving him from his house to the East London Mosque in Whitechapel, then to a restaurant along the Whitechapel Road where the car appears to be double parked in a bus lane while the mayor goes inside. 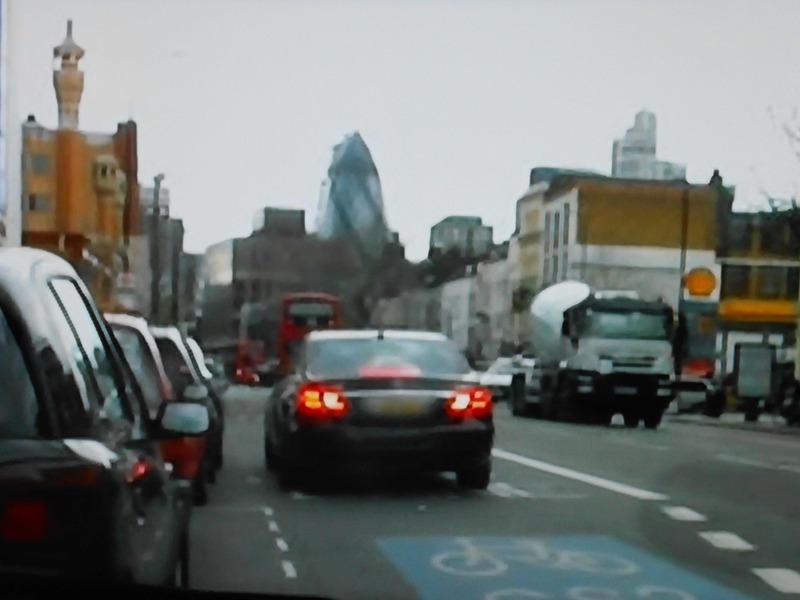 The sequence brought anger from Tower Hamlets Tory Opposition leader Peter Golds, who said: “What was damming was parking in a bus lane and on yellow lines. The Mayor’s office later said the programme made a number of claims about use of the car which it “strongly disputed” with Channel 4. It said in a response to the limo double-parked in a bus lane: “Lutfur taken to Zaza’s Grill was a working lunch with local residents and organisations. The Mayor’s Office later pointed out to Channel 4 senior executives the Ofcom broadcasting watchdog’s code that any claims made should also carry a response. “We made it clear to Channel 4 that a failure to carry these corrections would result in legal action,” said a statement. The Office listed 12 points made in the documentary—half of them about the chauffeur waiting or driving round while the mayor goes inside a building, responding that the driver is on the council staff and doesn’t cost taxpayers extra. It added: “We also believe the petrol for the time spent ‘circling’ is less than parking charges for the equivalent time. The programme, in fact, does carry response from the council to points it makes. The programme makers, Juniper Productions, made a number of claims in connection with the Mayor and the use of the council’s hired chauffeur driven car which we strongly disputed with Channel 4. As a result, and having drawn the attention of the channel’s senior executives to the relevant section of the OFCOM code, each of the claims broadcast also carried the council’s response. We made it clear to Channel 4 that a failure to carry these corrections would result in legal action. I am attaching below, a list of the Dispatches claims and the council’s responses. In response to a Freedom of Information request that revealed exorbitantly high taxi costs, the Mayor ordered a review of travel arrangements. It is our opinion that the taxi company may be overcharging passengers. The driver has been a salaried member of staff for many years, serving under several successive administrations. The 30 minutes waiting time will not have resulted in any extra cost to the taxpayer. The Mosque is a key community hub. The Mayor regularly goes to Friday prayers after which he is accessible to residents, meets with local residents and discusses their concerns. We have examples of casework raised by the Mayor following this visit. The driver has been a salaried member of staff for many years, serving under several successive administrations. The 1:30 hours’ driving time will not have resulted in any extra cost to the taxpayer. We also believe that the cost of petrol for the time spent “circling” is less than parking charges for the equivalent time. This was a working lunch with local residents and organisations. Clearly this is not ideal; however our understanding is that the car was only in the bus lane for a matter of minutes. There is no evidence that this constituted an offence under the Highways Act. The 1:35 hours’ driving time will not have resulted in any extra cost to the taxpayer. The driver has been a salaried member of staff for many years, serving under several successive administrations. The 1:30 hours’ driving time did not result in any extra cost to the taxpayer. The Mosque is a key community hub. The Mosque is a key community hub. The Mayor regularly goes to Friday prayers after which he is accessible to residents, meets local residents and discusses their concerns. The driver has been a salaried member of staff for many years, serving under several successive administrations. 2 hours’ driving time will not have resulted in any extra cost to the taxpayer. The Mayor also attended the funeral of the mother of a councillor colleague. The Mayor’s wife transferred the dry cleaning from her own car to the Mayor’s car the previous night. The driver merely gave the Mayor this dry cleaning. The driver arrived early, taking the Mayor to Trinity Square Gardens, a significant distance from his home. I’d take it more seriously if he knew how to use an apostrophe. And have just noticed the little gem in point 12 – that Old Montague Street to Trinity Square Gardens is a “significant distance”. Really? It’s 0.9miles; that’s less than 20 minutes by foot, or 12 minutes by foot and public transport. Significant, yes: but not in the way Lutfur means.